Goddess Charters offers a variety of options for reef and bottom fishing off the shores of Boca Raton and Deerfield Beach Florida. 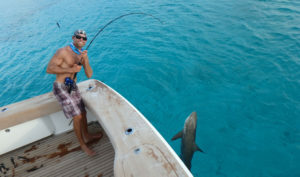 Our Captain Cory Burlew has 20+ years of fishing experience in South Florida. He has a vast knowledge of the fishing area and knows some of the best locations for reef and bottom fishing. Our goal at Goddess Charters is to provide you with the best opportunity to catch fish and have fun. Whether it’s simply drifting at various depths to find table fare or fishing submerged wrecks for a more challenging outcome, Goddess Charters provides several options for catching bottom fish. Some of our favorite fish species we target are snapper, grouper, sharks, and amberjacks. We use light to heavy tackle while bottom fishing and the rich sea bottoms of South East Florida are ideal conditions for a great fishing experience. Grims Revenge – Get Ready to Catch Fish! Our boat, Grims Revenge, and skilled fishing team are perfectly equipped to provide an ideal 5-hour or 7-hour long reef fishing adventure. Our charter boat is fitted with the appropriate equipment to enable you to make the most of your bottom and reef fishing experience while fully enjoying the sea surroundings and peaceful nature around you. 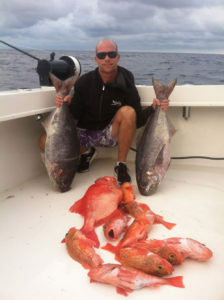 Reef fishing is very popular among our clients. We can usually take you bottom and reef fishing throughout the year depending on the sea conditions. Before booking your trip, you will have an opportunity to speak directly to Captain Cory to find out your best charter fishing option to ensure you catch fish and enjoy your fishing trip. The Goddess Charters team teaches and helps you catch fish. Bottom and Reef Fishing requires patience and understanding of fish species behavior. However, there is no need to worry about this – our experience captain and team members have tested their bottom and reef fishing skills numerous times and have the skills and experience required to teach and help you get the best possible catch. Just browse through our gallery of recent fish photos and you will find out just how great your fishing experience will be with us.